Pasadena, Calif., February 1, 2019 – Today at the Television Critics Association Press Tour, PBS KIDS announced that the new animated series XAVIER RIDDLE AND THE SECRET MUSEUM will premiere on Monday, November 11, 2019. 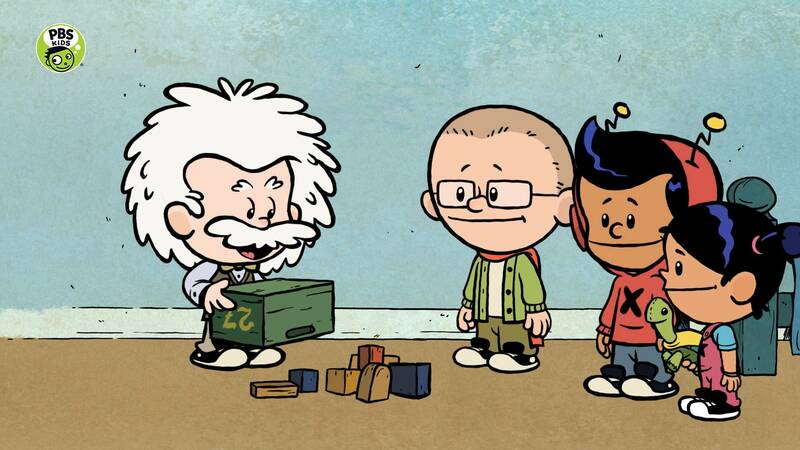 Based on the children’s book series Ordinary People Change the World by New York Times bestselling author Brad Meltzer and illustrator Christopher Eliopoulos, the series will introduce kids to inspiring historical figures and the character virtues that helped them succeed. The series is produced by 9 Story Media Group’s award-winning animation studio Brown Bag Films, and will debut nationwide on PBS stations, the PBS KIDS 24/7 channel and PBS KIDS digital platforms. The series follows the adventures of Xavier Riddle, his sister Yadina and their friend Brad. In each episode, the three face a problem and must turn to the Secret Museum to help them solve it. The Secret Museum allows the three friends to travel back in time to meet real-life historical figures when they were kids. XAVIER RIDDLE AND THE SECRET MUSEUM takes a fresh and accessible approach to teaching kids ages 4-7 about important historical figures and the experiences that shaped their lives, while exploring social emotional concepts and character traits such as courage, resilience, and setting and accomplishing goals. Each episode is designed to help young viewers make the connection between the attributes that made each historical figure a hero and those same qualities within themselves, helping them to recognize their unlimited potential. From an inspirational encounter with a young Marie Curie, who follows her dreams no matter what, to learning from a school-aged Harriet Tubman, who models courage and bravely moves forward even when she is scared, the series will help kids relate to seemingly larger-than-life individuals. Other historical figures to be featured include Alexander Hamilton, Susan B. Anthony, Maya Angelou and more. In addition to the XAVIER RIDDLE AND THE SECRET MUSEUM series premiere, kids, parents and teachers will be able to stream clips and full episodes across PBS KIDS’ video platforms, including the free PBS KIDS Video App. XAVIER-themed games will be available on pbskids.org and the free PBS KIDS Games App. To extend the learning at home, parent resources, including tips and hands-on activities, will be available on the PBS KIDS for Parents site. For educators, PBS LearningMedia will offer classroom-ready materials, including video excerpts, games, teaching tips and printable activities. Produced at Brown Bag Films’ Toronto studio, executive producers on the series are Vince Commisso, Brad Meltzer, Christopher Eliopoulos, Fonda Snyder and Rob Weisbach. The series is directed by Cory Bobiak (Peg + Cat), with Meghan Read (Dot,Dino Dan) in the role of executive story editor. The look of the show is based on Christopher Eliopoulos’ illustrations featured in the Ordinary People Change the World series. 9 Story Distribution International has worldwide distribution rights outside Canada, while 9 Story Brands is managing global licensing and merchandising rights. Inspired by his love of history, #1 bestselling author Brad Meltzer was determined to give his kids better heroes to emulate. Teaming up with award-winning artist Christopher Eliopoulos, they created the Ordinary People Change the World nonfiction picture book series that focuses on the traits kids can aspire to in order to live heroically themselves. With over 2.5 million books in print, including titles like I am Amelia Earhart, I am Abraham Lincoln, I am Rosa Parks, I am Jane Goodall, and the recent, I am Neil Armstrong, their series from Dial Books for Young Readers sits on the shelves of children nationwide.